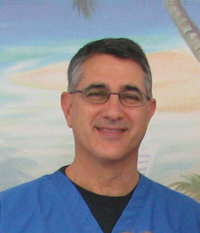 Pediatric dentist Mark S. Levin has been working at Children's Dentistry & Orthodontics since 1981—nearly 30 years. He completed his undergraduate education at Emory University with a Bachelor’s degree in Biology in 1975, then entered the Emory University School of Dentistry and graduated with his Doctorate of Dental Surgery in 1979. He continued his studies with post-graduate specialty training in the pediatric dental program at Emory University, graduating in 1981, and joining Children's Dentistry & Orthodontics. He is currently a member of the American Academy of Pediatric Dentistry, the Southeastern Society of Pediatric Dentistry, the American Dental Association, the Virginia Dental Association, and the Tidewater Dental Association. Dr. Levin and his wife Janet are the proud parents of two daughters, Emily and Jillian. He and his family enjoy spending their free time boating—a lifelong passion for Dr. Levin. They especially enjoy exploring the rivers, bays, ports, and marinas around Hampton Roads and along the Chesapeake Bay. They also enjoy biking, hiking, and walking on the beach with Sailor and Skipper, their beloved Cavalier King Charles spaniels.